As I was very lazy yesterday, and played a lot at the computer, I'll have to make up to it today LOL! So first there's the shopping and then the room etc. cries out for me with "I need a sweep with the vacuum cleaner and the dustingcloth"!!!!!!!! Amongst other things. Oh, I received a mail yesterday from the office supply shop, that they would go on with another candidate for the job. Of course I was a little disappointed, but I already expected it to be so. Okay, have to see if there might be another part time job for me. Jan still didn;t hear about his appplication for the nightshift, which I find a bit strange, to say the least! He called them Wednesday, then the person he needed wasn;t there, yesterday he phoned them again, then she was in a meeting, he asked to be called back, but still nothing. So he will try again today. Wednesday we did go to the market, it was ever so nice weather for it, and came home with not too many things, but okay. Bought there 5 kg. of potatoes, bag of onions, a Chinese cabbage, some sweet paprika, and for very cheap 6 rolls of kitchen paper, oh and some apples. Good we didn't buy anymore, cause by them my shopping car was completely filled. Yesterday and today weather isn;t that nice anymore, it is colder by several degrees, almost no sun, it's a pity, but they say next week temps will go up again, however, the forcast is different when you look at different ones. Very confusing, for simple human beings like me LOL! 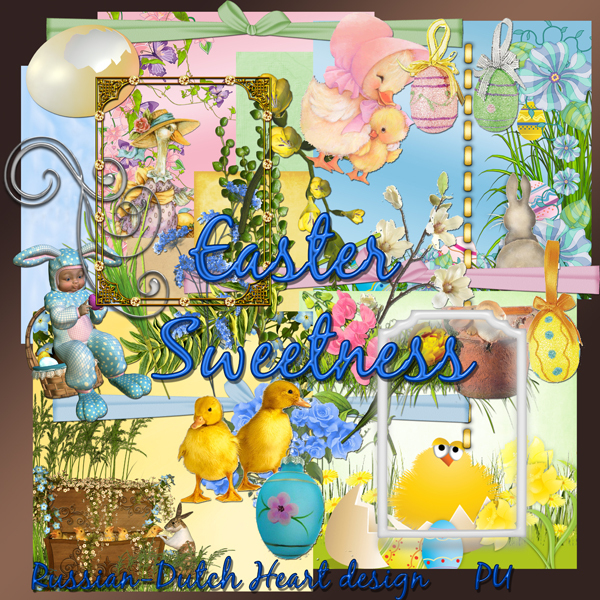 I promised you an Easter kit for today, and so it will be, it's named Easter Sweetness. 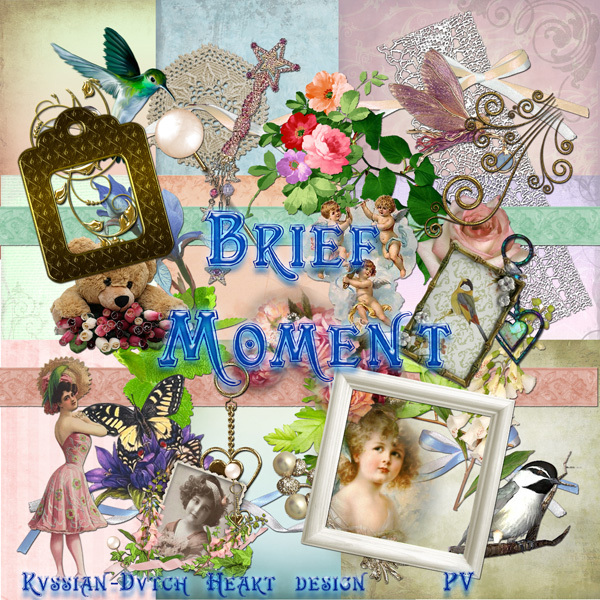 And then you will have to scroll down a bit more to find some lovely clusters and a page made by Arlene with the "Brief Moment" kit. And there's also a link to Miriam's Scrap again, where you can find a lovely goodie from Miriam herself and then two more QP's made by Mat with my Earth to Sky kit. So you are having some treats to help you through the weekend LOL! Have a wonderful weekend, stay safe and healthy, see you on Monday again! Well, today probably will be the last real sunny and warmer day, next few days weather will change a bit and will get colder again. But I saw that by next week temps will go up again, so no need to get drpressed LOL. As it will be a good day to walk we planned to go to the market, again, and hopefully we will be able to find some stuff to fill the freezer again, mainly veggies, and for a good price, of course. Monday was a quiet day, but yesterday I was in full activity again ROFL. As usual, first the shopping, in the mean time I let the washing machine do its job, so when I was home again, I could hang the stuff outside. And this was a good time to change the bedsheets and duvet covers too, with an empty machine. And so I did! Even did a little bit of work in the garden, not much, but now is the time that you see something to do, every time you take your little walk through the garden. Also found soe time to finish another kit and start with another. 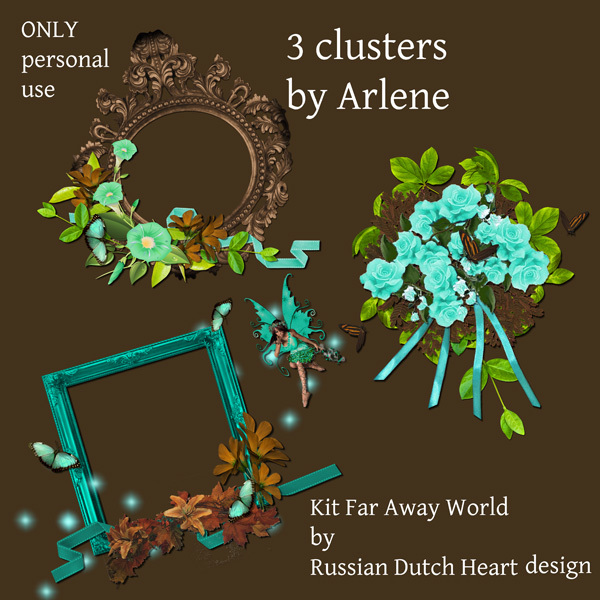 And..............I have more of Arlene's clusters for you! She made some with the Call it Olive Green kit, so I will post them today, and next time I will have some "Various clusters" from her for you again. And if you would like some great quickpages, then go to Miriam's scrap, where Mat has posted some, made with my From Earth to Sky kit. And if you like one more, go to Miss Edna's Place, where you can pick up a lovely QP she made for a qp-challenge! On top of this all, I also have a kit for you. No. 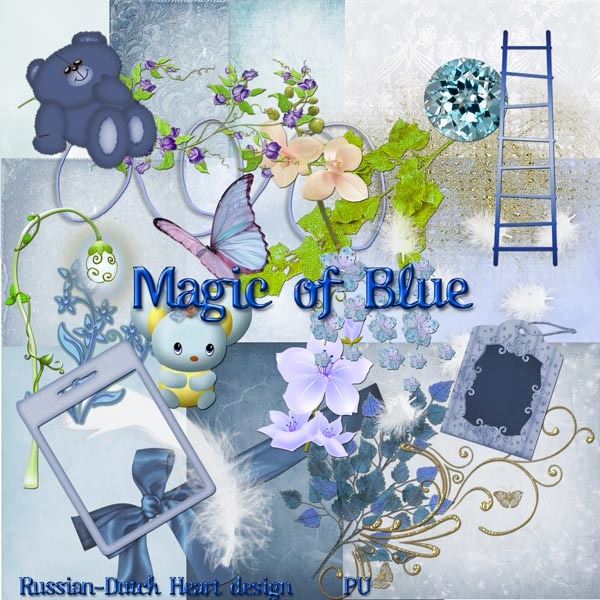 not an Easter kit, that will be for Friday, I think, but a sweet kit in blues, named "Magic of Blue". Have a wonderful day, thanks for your visits and comments, ( I have the feeling I don;t write that enough). Gold, Silver Bronze weekend and a hard task! Weather has been good to us, although the "underground"of the air is still a bit fresh, when you are in the sun it is lovely weather! So in between watching the WC speed skating this weekend, we also enjoyed a bit the sun in the garden, I even planted some seeds, some of climbing sweet peas, then also a species that will grow till about 50 cms. high, and I've tried my hands on peas this year LOL. Very curious if they will come up and will give us some peas!!! Oh whee, the skating was very succesful for our Dutch team, we got 14 medals in total, of which were 5 golden, 5 silver and 4 bronze ones! There are hopes then for the Olympic wintergames yeah! I received an award from Miss Edna's place!! Rules are very simple. First, you must thank the person giving the award. Well, thanks Edna for thinking of me! 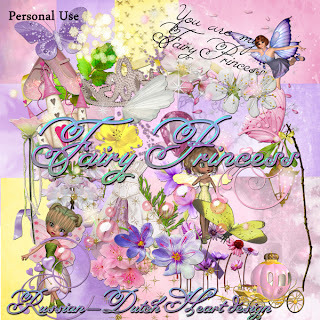 Next, you must share seven things you think people might find interesting about you and select seven fellow bloggers to give the award to(let them know by a quick message, of course). And this is the hard part of it. 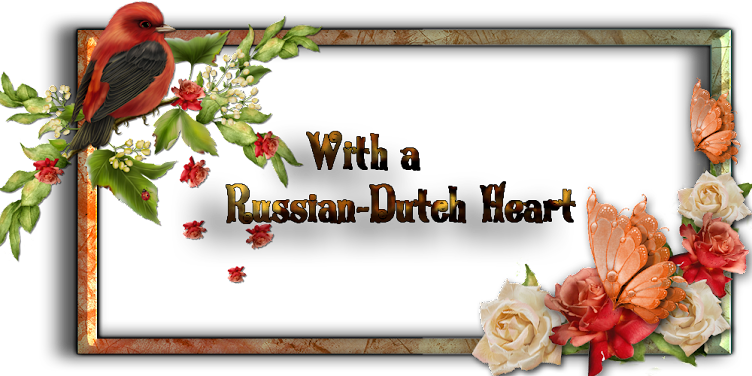 Not even to find 7 fellow bloggers, but to tell you 7 things about me, you might find interesting and do not know yet. I will give it a try, but it isn;t easy! Yes, I am perhaps lazy, but couldn;t come up with more blogsThese are the ones I almost visit every day) so It has to stay like this. 1) When I was a little girl of about 4 years I had a big passion, that was ballet dance! As my mother did that, and gave lessons, I watched well and every evening after dinner I had my half hour of ballet. Mama even made me a real tutu for it. And I was serious about it, oh yeah. But, although I took lessons with my mother when I was a little bit older it never came to it that I wanted to make my profession out of it. 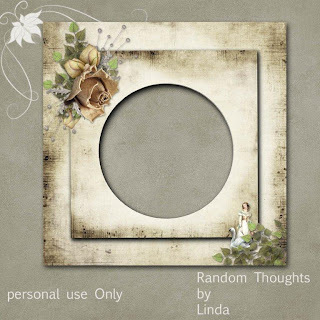 2) I am in general a very quiet person, lots of things are going round in my mind though LOL. But at times when I get very excited and cross about something, I can be very (!) hot-tempered, mostly when I have the feeling I am treated not right, or un-fair. I've learned a bit to control that, but sometimes ........ And then I am not nice at all! 3) I finished my secondary school when I was 18, it was a great one, called at that time the MMS, Middelbare Meisjesschool (this doesn;t excist anymore), but it was a great one, cause you had a very broad education, all foreign languages,(French, English and German) history, biologie, geography, art-history, music, mats, chemistry and physiscs, (those a bit less, but extended basics), it really was a great education, and after that I did one year of Trade school, as it was called, where we had commercial correspondence in all 3 foreign languages and of course Dutch, and to it even typing and short hand. After that I went working at administration at the firm, where my father worked, I was lucky, cause just at that time a girl left because she was pregnant and her place had to be filled in. Well, I stayed there for 29 years! 4) Creativity I got from my mother, together we did a lot of things, like painting, drawing, we spent hours painting Russian icons or scenes out of Russian fairy tales, my mother mostly did painting, I very much liked pen drawing. We even managed to have a few small exhibitions with our work. 5) Started to play the piano when I was 8. I was rather good at it, won some prizes, but never had the ambition to make it my profession. 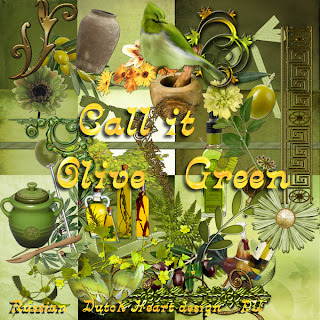 6) Like Edna, I also would like to write a little book LOL. But although I have lying around a start for it, I don;t know if it ever will come to bloom. Perhaps deep down in my heart I am uncertain if I could do it, and then also questions come up like: How to get it published, where to go and if somebody would publish it, how to be certain you are not cheated?? I think I have the problem of not being self-assured enough about my possibillities and qualities. 7) I love nature, I love animals, and in general I love people, am not the most talkative person in company, but like to listen to people and watch them. I am sure I forgot to mention things, but gave it my best LOL. On to blog-business now! 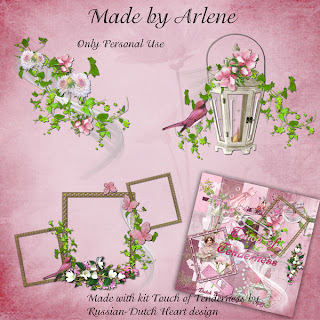 Make a visit to Miriam's blog where there are posted again some goodies, as by Mat, using again one of my kits. 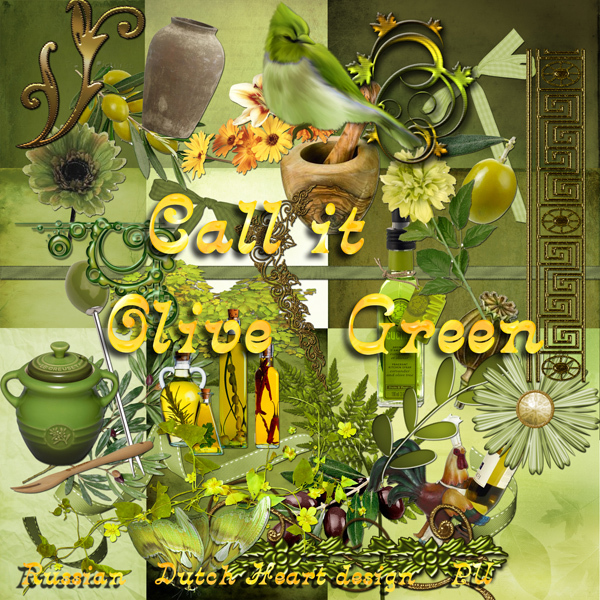 And to complete this blogpost I have another kit for you named "Call it Olive Green"
It definately is looking bright outside. Oh, how lovely it is, to wake up in the morning, opening the curtains and looking at a sunny world! Jan applied for another job yesterday, he did it almost completely himself, meaning he typed the letter for it on the computer, LOL. It's a big thing for him, but if he does that every now and then, he will have some experience (well, at least he will know the basics)and that never can hurt. This job is for help in nightshifts in a smaller elderly home, 7 days on and 7 days off. It would be a great job for him, he likes evening and nightshifts. In the mean time I was chatting with Heidi. Yes, she did come over and it was real nice to be together for a while again. And we could do our chat sitting in the garden, enjoying the sun. She brought me some garden magazines, we always exchage them if we have them. And of course she didn;t leave without a couple of cutlings from plants in my garden LOL. I really hope they will grow nicely. Today I am a little bit in a hurry, cause I want to do the weekend shopping before early afternoon. Why that? Because there are the World Championships speed skating per distance. It alreaady started off yesterday, but the broadcast was late afternoon and early evening. Well, it wasn;t yet a great succes for the Dutch team yet although we managed to get a bronze medail on the 3000 mtr. for women. But today some of our best skaters will compete on different distances and we have good hope that we can win a few medails. Have to be ready to watch this mid-afternoon.! During the skating it will be a good time to turn the washing machine on, may be I can even hag the laundry outside to dry. It sure would give the laundry an extra freshness. 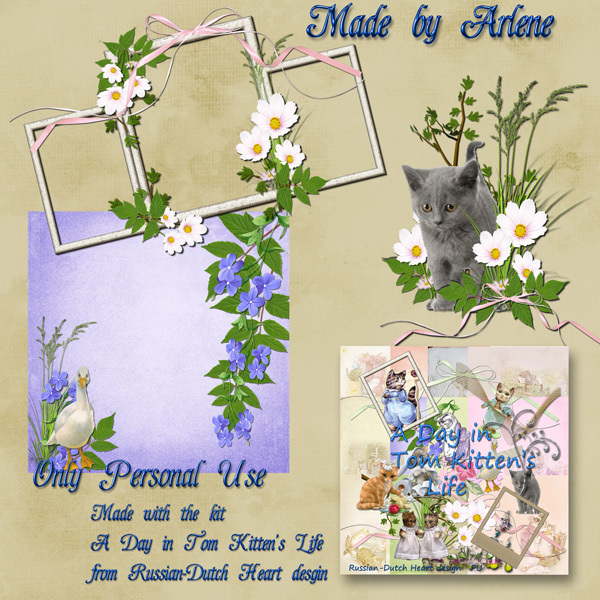 Before we jump to a goodie from Arlene, I will give you the link to 2 quickpages from Mat, she made with the Satisfaction kit. 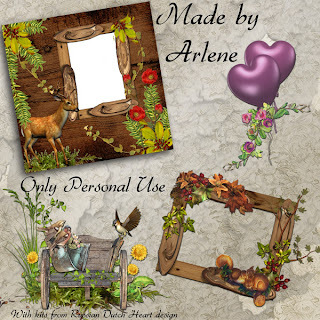 You go to Miriam's blog for the download, and while you are there, scroll a bit down, cause Miriam herself made some lovely goodies, now that she has recovered from a bad flue. Now here the clusters and a quickpage by Arlene, from the Fairy Princess kit.I think they are beautiful! And don;t worry, I too have something for you LOL! A kit, in a bit vintage style, named "Brief Moment". Now I just have time to do a bit of work on a new kit, but then I have to get moving, to have done all before the skating begins. Unbelievable, may be, but Monday I made a little promise(to myself), and I kept it LOL! Oh yeah, all the laundry is gone, I did the ironing, and all is on it's right place in the closet. And I even re-arranged a little bit the spare room, well, not all but it's a start. In between I got a phonecall from Heidi( she must have been telepathic, cause I was thinking of her and said to myself I would call her later that afternoon!) and I even made it a short call, cause I wanted to get on with the laundry. We made an appointment for tomorrow, she will come by and then we have some time to chat. Then yesterday I did the shopping, well, most of it, and.........big news..........applied for a part time job in a book- and office supply store. Not really something in the line of work I have done, but I like those kind of stores. I am not expecting to get the job, but if you don;t try you'll never get something. Hahahaha, I even wrote in my letter, that regarding my CV it wasn't directly in my line of work, but that I would be a very enthousiastic and motivated candidate, and that I didn;t feel ready yet, to be "out of the picture" ( if you should translate our expression for it as it is it would be"not ready to sit behind the pelargoniums"). Not good news for Jan either, he got an rejection to his appliance. Well, it would have been too much to be lucky the first time, so today he will write for another one. He always can go to a work agency for flex-work and then I am sure he will get work, but it would be better to get a job for steady right away. So, we are not desperate, we knew it would take some time, specially because we aren;t the youngest anymore. Oh yes, after I came home from the shopping, I really needed something to eat, so made myself a sandwich and went into the garden, put a chair on a sunny spot and took my first sun-sitting this year, LOL. Oh my, it was real nice and perhaps I will do that today too. Might just be for 15 minutes, but that's okay. We really have a few days of real spring feeling. Jan is like the "motherhen", putting his seedlings in the sun at daytime and when the evening comes he takes them in again. grin-grin. But he is right, the nights are still too cold to let them stay outside. With all those things we keep ourselves busy enough besides the puzzling, computering, etc. 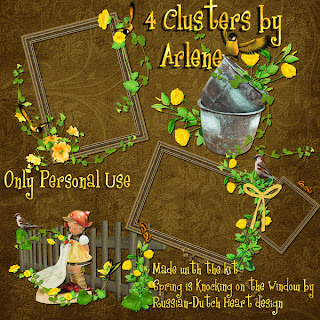 I have some more clusters from Arlene for you (made from various kit, she also sent some made from the Fairy Princess kit, but I will have to make a preview and upload it first). 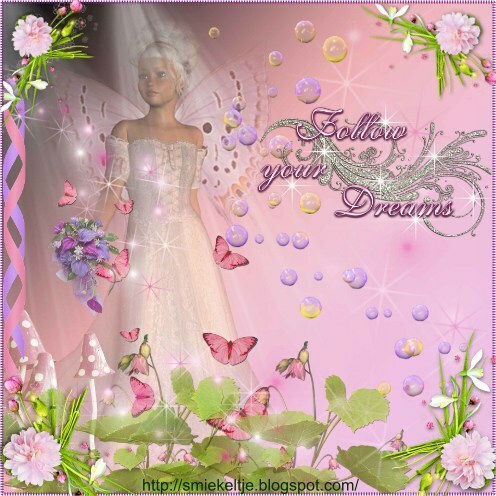 On Edna's blog you should scroll a bit down to find it! And here a little kit for you, "Just Smile" ( something we should try to do every day at some time). Oh, I enjoyed the weekend, I promised myself to do almost nothing and I kept my promise LOL! 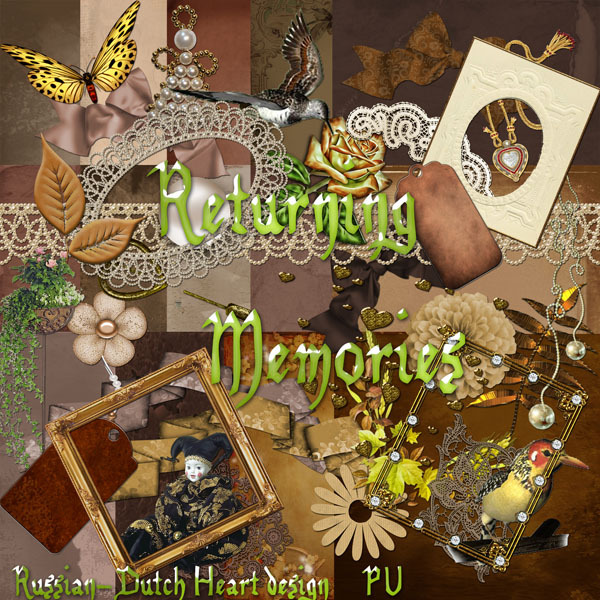 I spent a lot of time at the computer, found some music I can burn on a cd( mostly "Oldies"), but also finished a whole new kit again and made previews of clusters from Arlene, and I know you will love them! More clusters are made, by Mat, that she offers on Miriam's blog. 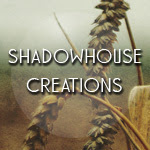 Then you could make a visit to Mat's own blog, showing some lovely layouts and if you are on Facebook, she's there too with a beautiful layout. Well, yesterday I mailed the Jan's application for the job, now we will have to wait if they will call him for an interview or may be better, to come to work. Sure hope it will be a succes right from the start. We should be ready for some real nice weather here, they promised us temps will go up again a bit, with some days of sunshine, is it really going to happen???? Today looks good, sun is shining, lots of blue in the sky, yippieeeeeeeeeee, I can dig that. It makes me feel right away more energetic, not saying that I will go through the house like a mini tornado, ROFL, but I definately want to do some ironing today and what's more, I really want to get it all in the closets and have the impression that the "spare"room looks a bit tidy. ( I know that is wishful thinking, cause there are always things in it, that have no place in the rest of the house, grin, grin, but I can tidy it all a bit up, re-arrange it and it will look much better). Had a wonderful time yesterday evening, watching another episode of my present favourite program, Larkrise to Candleford. Such a pity it only lasts about an hour!Then we watched a weekly quiz,and after that a recorded episode of Silent Witness, and after that I was ready to go to bed. ! Woke up after a sound sleep at about 2 o'clock at night, went back to bed at 3 and slept sound and well again till 08.15 this morning. It was a bit crowded in the bedroom you could say, not only Jan and I were there, but also out two cats, lazy creatures as they are LOL! One at the footend and the other on the window-sill. What a life those cats have! They lay around for hours, then with difficulty stand up, make a walk in the garden, lay around in the sun again, when they are hungry, food is provided, and go to sleep again. Oh, they are a tiny little bit more active, cause we already had twice a little present, can you guess???? Yes, a little mouse. Hard to be grateful to them, but you have to be enthousiastic about it and tell them they are great hunters! It's in their nature, and we have to be realistic, but it always makes me feel a little bit sad when I see the dead little mouse. Let's go to your goodies for today. First some lovely clusters and quickpage made by Arlene, with the Dark Age kit. 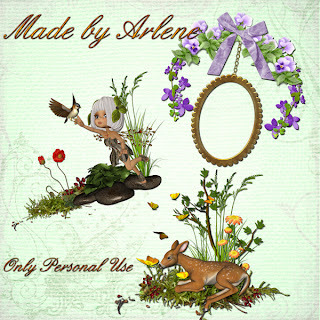 Thanks Arlene, again! 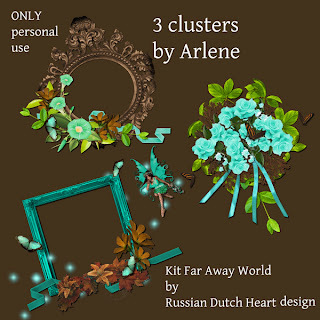 And I know, I am spoiling you, but I will put on some more clusters made by Arlene from various kits of mine.!!! 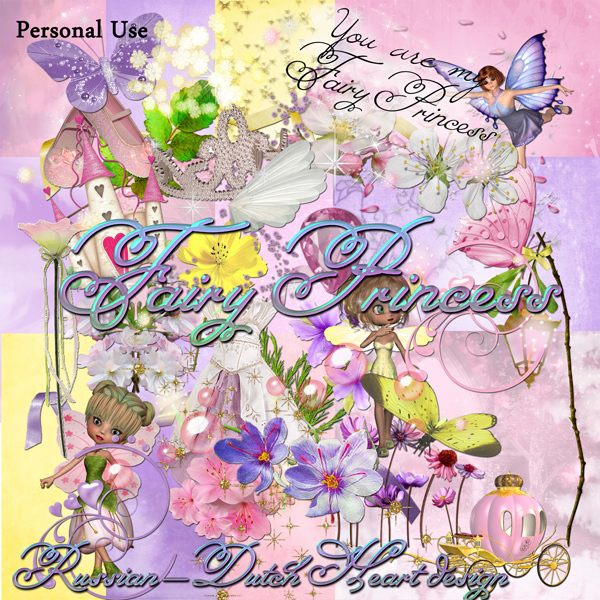 Then I have a kit for you, I;ve made by request of Natalia, she wanted to have something to scrap some special pages for her little girl, something a bit princess like, with some sprakles and such, so I hope I succeeded in this "Fairy Princess kit". Now I am going to enjoy this day, sunny and all, you have a fantastic day too! Probably long post and anniversairy! I will start with the anniversairy! Today Jan and me are together for..............20 years!!! Can you imagine, how long that is already??? I hardly can believe it myself! Yeah, 20 years ago we went to a birthday party, I almost dragged him into the taxi home and never did let him go LOL! Amazing how things can change your life. That said, I have things to show from several visitors, or at least giving you links to their blogs, and I truly would appreciate it, if you took the trouble to visit them. It's not all without compensation, lots of goodies to download there for you! Let's start with Mat, she has made some wonderful layouts with some of my kits, you can see it HERE, and a cluster and border from the Far away World kit, that you can download at Miriam's Scrap. 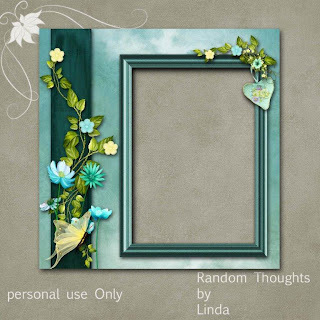 Then Linda has made a beautiful quickpage with the Touch of Tenderness kit, you can get it on her blog HERE (may be because of time difference she didn;t post it yet, try it later again). I don;t think this a bad way to start your Friday with!!! I hope I didn;t forget anybody or anything, but if so, let me know! It's going to be a little bit exciting day today, cause Jan is going to telephone a bit later to apply for a job in the health care again. After a few years of not having a job ( lucky we could afford that at that point), caused by his health problems and somewhat later because of me, having some health problems too(yes, we ARE growing a bit older). I hope he will get an interview and who knows, may be for once he will be lucky and gets this job right away. If he succeeds, he will feel himself even better, I am sure of that. Will not be easy at start, to get used to the work again, but it would be great. Everybody cross fingers for him, cause now a days it isn;t very easy to get a job, certainly not if you are in your late 50's! I had hopes to catch a whee bit of sun yesterday, but of course, I planned it and then things almost always go different, LOL. Not that it wasn;t lovely weather, it was great! But early afternoon I started to prepare dinner first(stuffed long paprika, with minced meat, it was yummie) and Jan went for a llittle walk, I did a bit of ironing, dusting in the house, vacuum cleaning, typed a new CV for Jan in Open office, I printed it out and if necessary I can mail it to his "future-boss", I hope. After I done all that, the sun was still there, but not shining anymore on the terrace, so sunbathing will be for another time. It's not over with all the goodies yet! 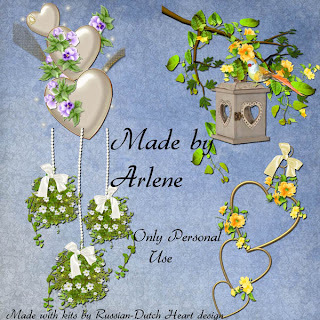 Arlene has made again wome wonderful clusters, with the Touch of Tenderness kit and offers them freely to you. By the way, you've noticed of course I changed my bloglayout again. 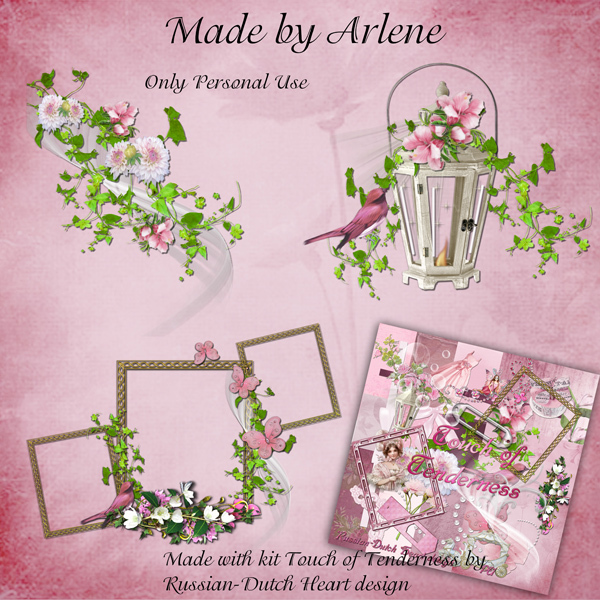 Also made with the Touch of Tenderness kit. Now it's almost time to wake up Jan, so he will be in time to make his call, and I have to get busy over here too. Should do just a few grocerie shoppings, not much, but a few things I still need to have. Well, I just can say I have enough to do, and also want to spend a bit of time at the computer too. So I bid you"Happy weekend", and offer you this kit : "Through Dark Ages". Although not very sunny, Monday was still a nice day, and I even did some work in the garden. I had a pile of pruning stuff and leaves and all lying in a corner, and I have now two big plastic sacs standing in another corner, filled with it. So Today we can put it outside on the street, to be picked up by the truck that collects all the garbage . Yeah, good job. Yesterday was grocerie time shopping again, well, it was also cloudy, but still rather nice outside. And it looking even better for the days to come. Today still is cloudy, perhaps in the afternoon we will see a bit of sun, but tomorrow should be a great day. Sun and temps around 60 F!! It will not stay all week like this, but we will grab what we can LOL! May be I can sit outside for a moment in the sun, starting to have some colour back on the face, because it's looking really white at the moment, yak! Today we will make it market day, I'll see if I can get us some veggies for a nice price, also need potatoes, bit of cheese, great things to buy at the market. May be even some seeds again for the garden. Jan is really enjoying seeding and growing the plants, and why not let him? We still have some pots to fill, so I certainly take a good peek at the flowerstand( and it's soooooo tempting!). 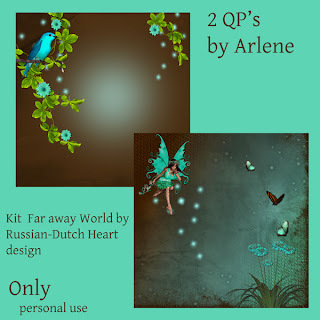 I receieved again a lot of clusters and QP's from Arlene, I told you she made some from the "A Breeze"kit, those I will post now. But she also made lots comining other kits, and you are in for a treat, I promise you. I will post them gradually, today the Breeze-ones. 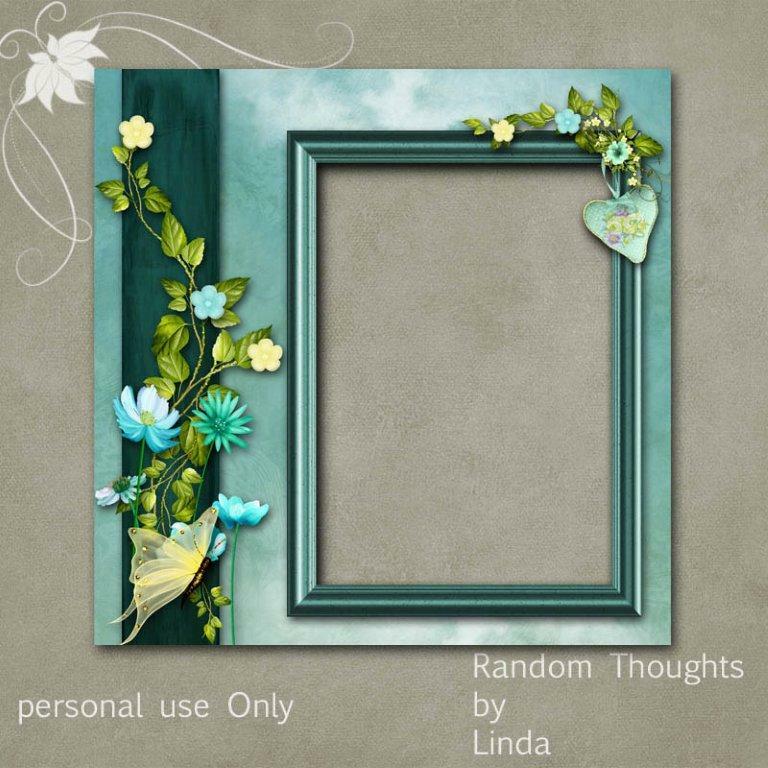 And another treat for you, made by Linda, also with the A Breeze kit, a lovely QP. You can go to her blog, to download it. Ha, today we can watch a new episode of one of our favourite series at the moment. It's called "Larkrise to Candleford", serie of the BBC, I just LOVE it. 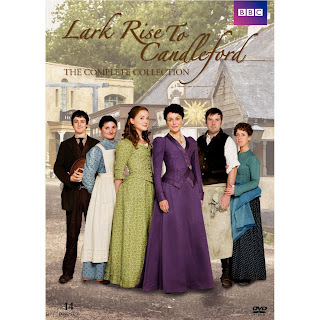 The series is set in the small Oxfordshire hamlet of Lark Rise and the wealthier neighbouring market town of Candleford towards the end of the 19th century. The series chronicles the daily lives of farm workers, craftsmen, and gentry, observing the characters in loving, boisterous, and competing communities of families, rivals, friends, and neighbours. The narrative is seen through the eyes of a teenage girl, Laura Timmins (Olivia Hallinan), as she leaves Lark Rise to start a new life under the wing of her cousin, the independent and effervescent Dorcas Lane (Julia Sawalha), who is Post Mistress at the local Post Office in Candleford. Through these two characters, viewers experience the force of friendship as Laura and Dorcas see each other through the best and worst of times. If you want to see or know more bout it, just Google the title and I believe you even can see a lot of episodes on You-Tube. So our evening looks to be good again, LOL, but first we will have to make it a lovely day. So time to get dressed and prepare for the market. Not before leaving you with another kit, "Touch of Tenderness"
Hope the flue keeps away from us. We spent a nice weekend overhere, not done much, but that's oh so nice. Well, I did first on Friday a bit of the house stuff, but the weekend days were spent most on designing, watching tv, a quick look into the garden and being happy with the careful arrival of Spring. Definately is looking it is very near! Yesterday there was some nice sunshine and in our town there was taking place a yearly event, the City Pier City run, and they had wonderful weather for it. It's a run for professionals ( half a marathon)and also for amateurs,( also could do half the marathon, but also only 10 km, 5 km, and for the kids 2,5 and even 1 km) who just like to do some sport. I believe in all there were 33.000 people taking part! Jan went out in the afternoon to take a look at the parcours, that wasn;t very far from our house, I should have gone with him, because it was real nice weather but I was just too lazy! When he was gone, I prepared dinner for the evening and when that was done, I went on with a kit I started. And nice coincidance, he met Heidi on the way. I have to have knock wood, but till now we are free from the flue bug and I just hope it stays that way! Just read that Miriam and husband are suffering from it and also Edna catched a bad cold during her holiday. And I read and here it more, so for every one suffering from the flue or bad colds, : quick and happy healing! Now today the weather is looking good too, we even have the garden doors open at the moment. And Jan is becoming almost a real gardener, LOL. Just now he is planting some bulbs into a large pot outside, it are lilies, just dwarf ones, in a nice soft pink colour. I hope they will do it well. I am really late today, I slept till late in the morning, so should be doing a not too long post. 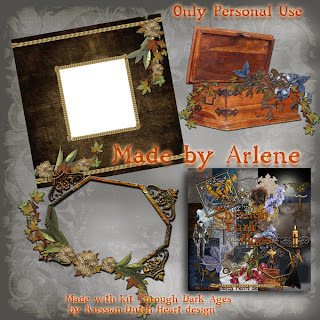 I have today again a surprise download for you, from Arlene again. 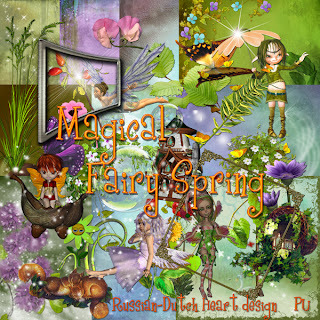 She made some wonderful clusters with the Magical Fairy Spring kit. 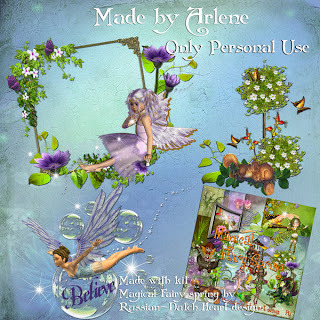 I think she is doing a real amazing job, and there's more in store for you from Arlene, just received another mail with some adorable clusters and qp's with the A Breeze kit, but they will have to wait till another blogpost. Then time for a kit too! Kit is in browns this time, could be great for some heritage scrapping, perhaps. Have to leave you know, I should get dressed now and have a sandwich and then I'll see what I will do today. Perhaps I will be active, or perhaps not, LOL! What did I do the past days? I think I was rather busy, on all different things LOL! She did sent me more, but you get an idea how lovely she makes them. Thanks to you, Cassie! 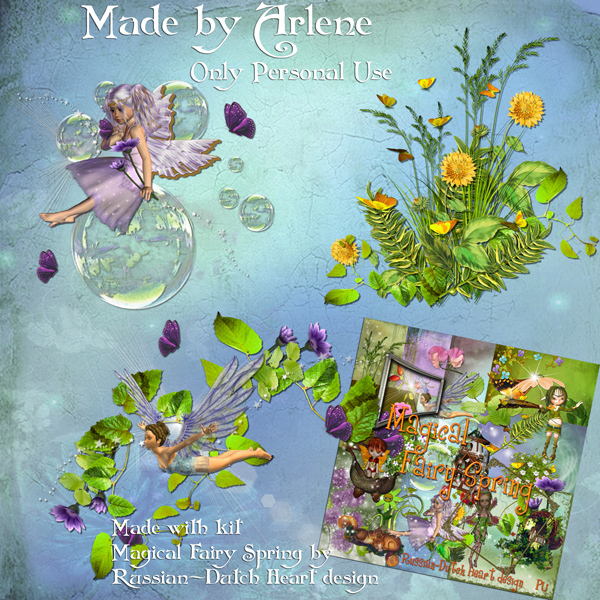 Then Arlene was real busy again and made a bunch of clusters with the Magical Fairy spring, but I didn;t had really time to make the preview and upload them, so you will have to wait till Monday, then I will definately post them. Also started to work on new kits, also not uploaded, I running behind!!!!!! Yesterday, when I came home, Jan told me with a big grin on his face, that he planted some of the bulbs we bought some days ago. But the wicked guy didn't want to tell me where he planted them! It would be a nice surprise for me when they start to flower, he said! And I couldn;t find the spots, cause he arranged the soil in a way I couldn;t see where he had worked!! Then Jan went out to buy a present for a friend and I decided it was nice enough weather to go into the garden and do some work too! I pruned the roses, the hydrangea, and did some cutting on plants that can do now without bloomed and dried parts. Pfffffffffff, I could feel I didn;t do gardenwork for a long time, but I will get used to it again ROFL. Still some more to do, specially need to cut off a lot of ivy, that is always growing like mad, but I think I will need some help from Jan for it too. All together, the garden seems almost ready for spring now, looks quite neat now. For today I just have to do some things here in the house, like the vacuum cleaner dance, grin, but that's okay. Today and the following weather forecast is not too bad at all, may be we could make a little walk, it's good for the mind, it's good for the condition, and may be even good for some photos from some starting spring, who knows? It's still not too late, so I will have a bit of time left to play around in PSE and may be even upload some stuff. Then first thing is get dressed and the house, and I also should make an appointment at the hairdresser, the hair really needs another cut now!!! Before leaving you, here I have another kit for you, named "A Breeze". Lots to show, lots of surprises. Monday I finally did some of the housework, yeah! A laundry, and changing of bedsheets, with removing the matras and boards under it, to give a good sweep with the vacuum cleaner under it, the bedroom took me a bit of time, but it was satisfying LOL. Jan re-potted the tomatoe plants, they are still small, but steadily growing, may be they will even grow to real plants with some tomatoes on them, grin. Yesterday was shopping day, some things always run out quicker than you think. It was a bit of grey day, today I think it will be cloudy too, may be again with a bit of rain, but........if they are right at the weather forecast by the end of the week temps will rise again and may be even reach around 53 F! With some sunshine to it too! Can't wait to see it happen, it might even look as if Spring is peeping around the corner. And if so, it will be a good time to plant the bulbs we bought and do some pruning, in short... garden time! Today will be a quiet day, probably, but I promised myself to do some ironing, sigh sigh, better do it now, I hate it when the pile grows too big, ROFL. Now some other things to tell and show. Got a few mails with nice surprises. First one about a nice lady who told me she used my Dolce Ricordo kit (you can find that one under the freebies of August 2011) for a bloglayout. 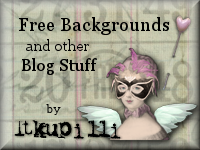 She is offering on her blog bloglayouts, and other things, take a look there, the link is http://sheadylandesigns.blogspot.com. 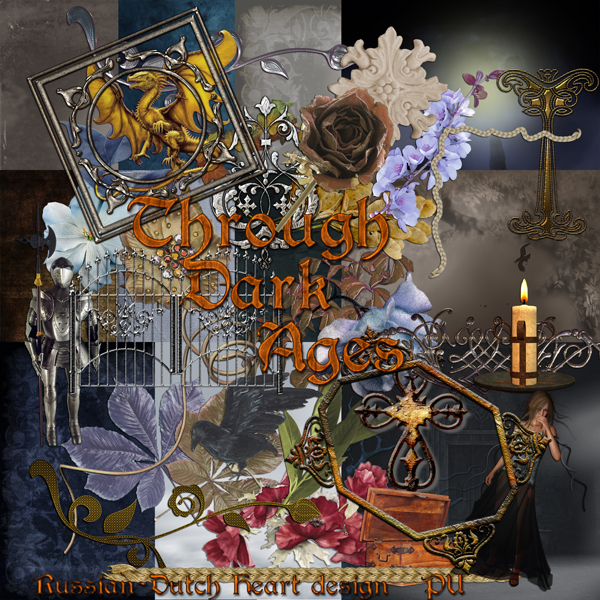 Here the previews, and if you download....well, you know the trick.....leave a little thank you! And then there is Arlene, yeah, again LOL! 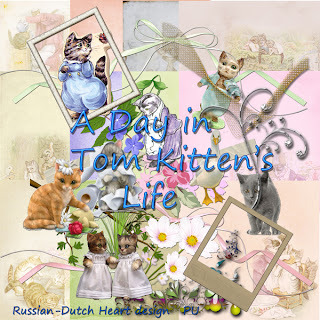 She made some fun clusters and a page with the kit A Day in tom Kitten's Life and I can offer them to you! That lady is sooooo quick, the ink of my blogpost(well, matter of speaking then hahaha) is hardly dry and hopla, I find some beautiful clusters in my mail. I can say it everytime over and over again, but it's the truth! 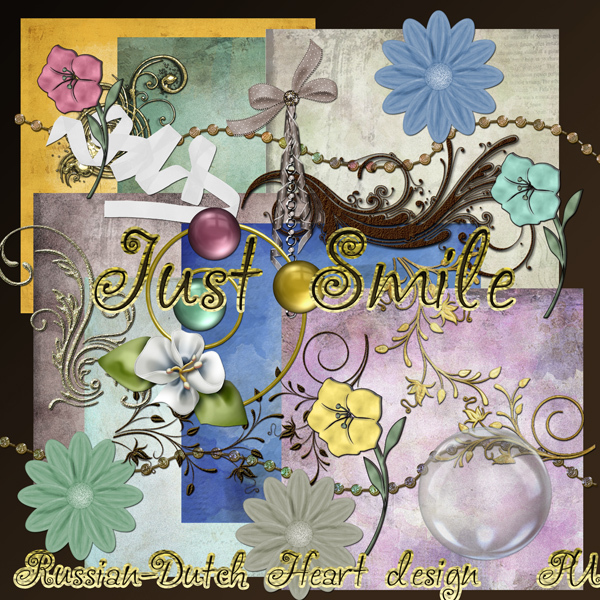 I feel so proud that people like the stuff I make and see the results of their work, and that's one of the things that keeps me going, also part of that your visits and comments I receive, all that together brings little smiles to my face! 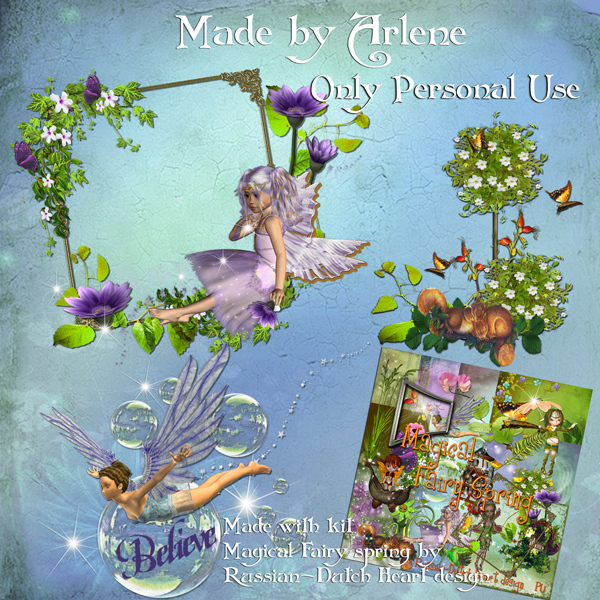 Here the preview from Arlenes work and don;t you forget a little word! 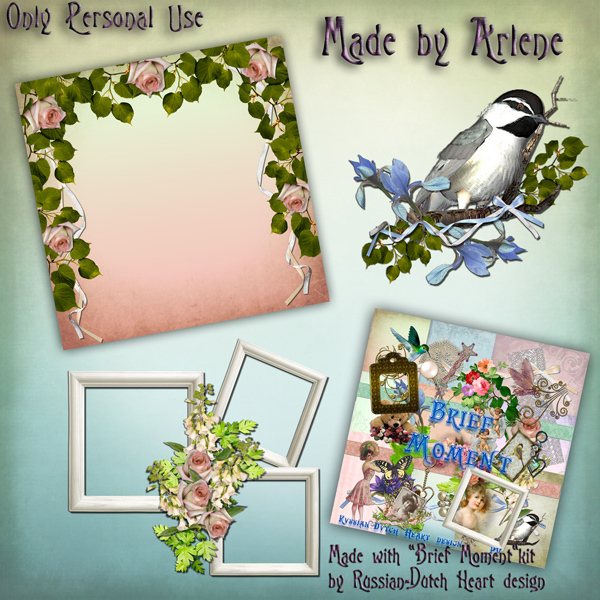 There are already such goodies for you, that it seems too much to post a freebie kit today!!! 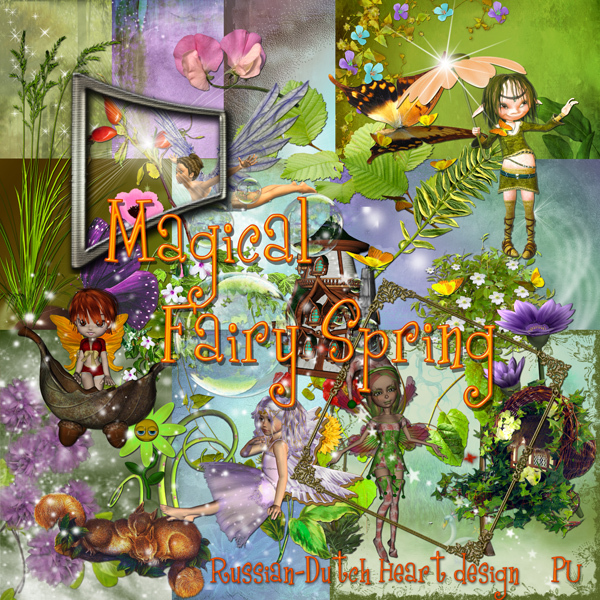 "Magical Fairy Spring". Have fun with it. And have a wonderful day!! Missed a great photo shot! Friday, after posting, I went for the shopping and yes, I had my pizza at dinner. And in the afternoon I tackled just a few housekeeping things and that was it. Saturday we started real slow. Took our time to wake up, LOL, had some coffee, a sandwich , quick shower, got dressed and finally we made a walk to the market. Although there wasn't much sun, the temperature was real nice. And a lot of people had the same idea, oh whee, it was really crowded there. But it was nice to walk there, take a look here and there at some stands, we didn;t buy much, but......... Jan has some work to do in the garden again. There was the stand with A LOT of bulbs and seeds, and of course I took a look. Bought two little seedpscks with summerflowers and there was an offer for 4 sacks of different bulbs(they had a big choice in them), for € 5,00, and Jan and I made a choice out of them. Now Jan can already start growing the seeds inside, and somewhere this month he can put the bulbs in the soil in the garden. I am afraid I will have to accompanie him in this, mainly, because I surely have to make a bit of place for them and I don´t trust him completely in replacing some plants that will be for sure in his way LOL! Oh, I missed a great photoshot while we were at the market. Although I had my little camera with me, it was still in my pocket, so not ready to `shoot`immediately. Okay, we were walking at the ´veggies`part and in a glance I saw something strange. I took a good look and saw a lady walking there, with a parrot on her shoulder. Not attached with a line of something, he was sitting all free and it looked as if he had a real good time.! It was a mainly green one and of a good size! Now isn´t that funny to see or not? And by the time I realized what I´ve seen, the lady and parrot have disappeared in the crowd and ......gone a great picture! Sunday was our leisure day, ROFL, I spent a lot of time at the computer, uploading some stuff, designing some stuff, great! Also received another gift from Arlene, so you are in for a treat again. But ladies, I saw that she had over about 150 downloads of her clusters last time and only some thank you´s for it. Now that isn`t very nice of you.!!!! I am used to it slowly, that it seems a hard thing to do for people to leave a short thank you when downloading something, but it hurts me a bit to see the same happening to Arlene. ( not including here the VERY nice ones, that do take a moment to leave a little comment). So come up, you downloaders, it`s all offered for free here, why cannot you return the favour by leaving a small comment?????? 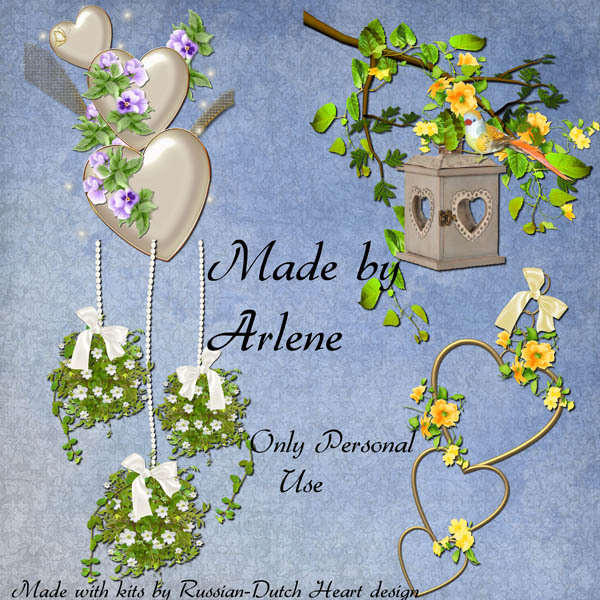 Nevertheless, Arlene sent me new clusters, made with my kit Spring is Knocking on the Window. And I can offer them to you, just as freebie!!! I think they are really sweet, she did a great job! Time for me to end this post, I did plan to do some work around here, it´s not playing time every day ROFL! 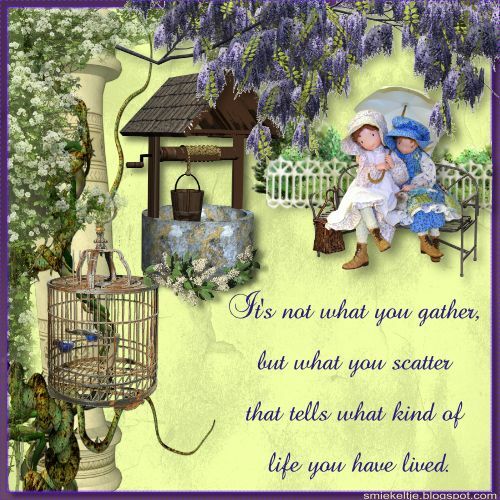 But I have also a freebie for you, another one made with some sweet pictures of a Beatrix Potter story. It´s about Tom Kitten, so I named the kit `A day in Tom Kitten´s Life, not the brightest title for the kit, but it will have to do LOL. Have a wonderful day and be nice! Oh, I went out out for the shopping on Wednesday, weather was rather good, so it was good for me to take some air. Nothing spectacular to report about that, though! The matter that still keeps our minds busy is the health condition of our Queen's son. It's not that you keep thinking of it all the time, but every now and then it pops into the mind. Yesterday we got the news on tv, that he was transported to a hospital in London( where the prince and his family have residence), but no change in his condition. He still is in coma and they cannot tell when or if he will awaken from it, and if so, his recovery will be very difficult, because he suffered serious brain damage. So all together not very happy news. Oh, boy, how could I forget this! Jan wrote his first email ever! A while ago he met two young girls in the cafe, they live just across our street, and the girls of about 20 years old left now for about 6 months to Spain, which has something to do with their study. And they were so nice to send us an email telling about their time there and of course Jan had to answer that. With a little help from me(LOL) he managed to send a message to them. I could see he was all proud about himself, grin! I also received a suprise in my mail from a visitor, Arlene. 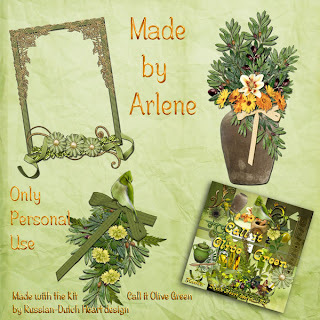 She made some clsuters and qp's from my kit Far away World, and as she hasn't a blog of her own, she wrote me that I could offer those as freebie on my blog. Now isn;t that nice? 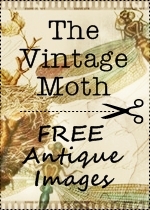 And I will have probably more to tell and show you about another visitor of my blog, but that will be for a bit later. It almost feels as if I have my own CT, ROFL. No, I don;t have one, but just the feeling of it makes me kind of proud. Yes, I am nuts at times, I know. But it is wonderful to be able to feel happy for a moment just because of a little mail with surprise. 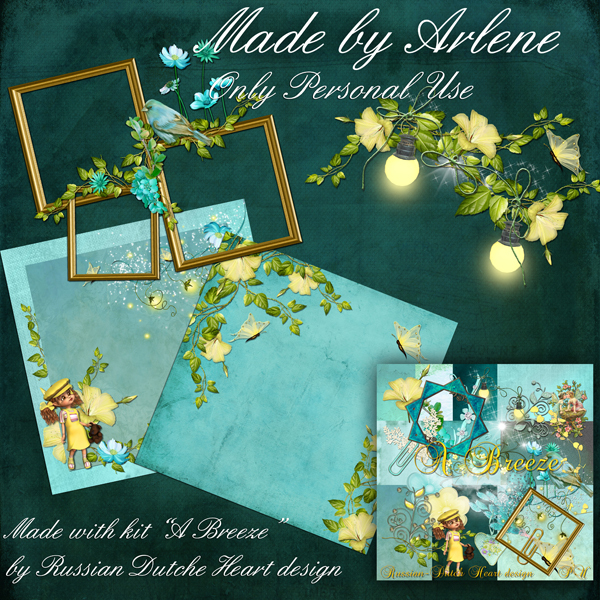 Okay, first I will give you the previews and links for Arlene's work and if you download leave a little thank you for her in the shoutbox or comment box!! And then I also have a kit for you, of course. 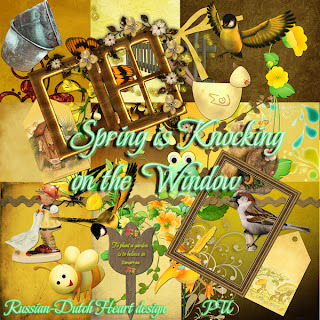 I thought we could do with a bit of cheerful kit, and that resulted into this one "Spring is Knocking on the Window". Off I go, after another cup of coffee, have to go out to get some medicin from the pharmacy, and get some last things from the supermarket. I think it will be pizza time for me this evening for dinner.